Verlassen Sie die ausgetretenen Pfade und erkunden Sie unbekannte, aber faszinierende Orte in der Nähe von Inverness. In einer kleinen Gruppe von nicht mehr als acht Personen besuchen Sie Carn Liath Broch, das Dunrobin Castle aus dem 13. Jahrhundert, das Naturreservat Loch Fleet und Dornoch mit seiner beeindruckenden Kathedrale. Vervollständigen Sie Ihre Erfahrung mit einem Stopp in der Glenmorangie Distillery, wo Sie optional Whisky genießen können. One word sums up this tour - farce! I had the unfortunate luck of being with a couple - so there were just 3 of us. The husband was tracing his family roots in Scotland so overwhelmed the driver /guide John with his personal questions. I meanwhile had to listen - what else could I do?! John should have said that he would be happy to discuss things with the gentleman at the various stops so that he could tell me/ us the info that he normally would. Almost from the beginning John was dropping hints about the Pictish Trail and how we could do something different if we wanted - like going to look for dolphins. He was pretty bearish about that part of the tour but I wanted to see it as my family lives in Seattle WA where there are loads of dolphins and whales. I don't need to travel thousands of miles to Scotland to look for the same. 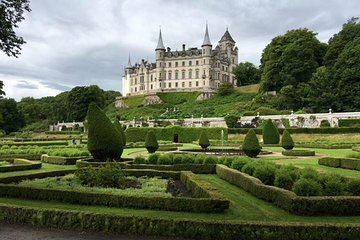 The highlight of the tour was the falconry display/show at Dunrobin had that not been there I would have rated this tour '0'. Watching the birds of prey fly was very interesting. Dunrobin itself was nothing special if you've seen a castle before yes it's large but well... not worth the price of the tour to get there. Lunch in Dornoch sp was awful - really awful - but the choices were limited. All in all, John was nice enough but I did not find this tour worth the price.